Mugwort is a common plant that is found all over the world. There are many different varieties, but this post will focus on the one most prevalent in our Mid-Atlantic region–artemisia vulgaris. The species name vulgaris speaks to how common this plant is. In fact, it is quite invasive, but every weed has a virtue. Uses: Mugwort is the herb that is most often used in moxabustion. Internally it is used to counter depression and rheumatism. Mugwort will stimulate menses when delayed, stagnant or absent. Mugwort is also known to promote highly vivid dreaming. For dream support, you can burn mugwort as a smudge before bed or put some under your pillow. 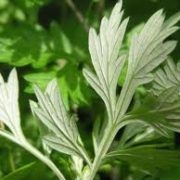 As a bitter tonic, mugwort stimulates digestive secretion, including the synthesis and release of bile. It can be used to prevent and diminish gallstones. With an affinity for the liver, mugwort is cooling and antioxidant to the liver, enhancing hepatocyte function. It can improve nearly all digestive issues, from acid reflux to constipation, when used regularly and in small doses (3-10 drops of tincture). Indications: Stagnant digestion, irregular menstruation, menstrual cramps or pain, depression, rheumatism, sciatica, gout, tension, colds, bronchitis, and other cold or damp conditions. Fun Facts: The name mugwort refers to the fact that mugwort was used in brewing beer before hops gained the monopoly on bittering agents. The genus name of Artemisia is associated with the goddess Artemis. It’s correspondence to Artemis is reflected in her silvery foliage that glows under the moon, in her action on menses, as well as in her spiritually therapeutic powers to help heal aspects of the wounded female, including marks of abuse from the astral body.